“This is a great opportunity for former college students to start paying off student loan debt, or those seeking a career change with growth opportunities”, says Wedding. 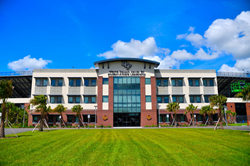 Jasper Contractors, Inc. is pleased to announce its participation in UCF Athletics Career Fair on Tuesday, March 26th, 2019. This one-day event held at Roth Tower will assist junior and senior athletes in identifying internships and entry-level job opportunities. As a UCF Athletic partner, the recruitment team at Jasper Contractors will be in attendance discussing open positions to graduating student athletes. The UCF Athletics career fair will allow students an opportunity to meet face-to-face with prospective employers. The Jasper team will be represented by Recruiting lead, Rich Mojica, and Adrian Bustamante, Director of Sales Development. “Jasper Contractors is actively seeking qualified candidates on all levels. Numerous positions are available in each of the branches consisting of office and support staff, construction management, general management, sales, project management, and other positions required to support recent company growth in Central Florida”, CEO and President Brian Wedding explains. The high volume roofing contractor is well known for offering competitive salaries, fully paid healthcare, and a student loan program. Field representatives are offered a base salary plus uncapped commissions and bonuses. “This is a great opportunity for former college students to start paying off student loan debt, or those seeking a career change with growth opportunities”, says Wedding. Jasper Contractors has been a proud sponsor of the UCF Knights since December 2017. As Jasper continues to expand its partnership with UCF, they recently announced the “Jasper Contractors Court” at the CFE Arena. Jasper Contractors, a high volume roofing company headquartered in Atlanta, Georgia, has offered roofing services since 2004. Company offices are located in Atlanta, Fort Myers, FL, Lake Mary, FL , Lakeland, FL , Melbourne, FL , Orlando, FL, Sanford, FL , Tampa, FL, and are i the process of opening branches in Naples, FL , Tallahassee, FL , and Panama City, FL. Jasper Contractors is an Owens Corning Platinum Preferred Contractor and is BBB accredited. Jasper Contractors, Inc. is a subsidiary of EX Capital, LLC.